At Bauma 2019, Imet (Italy) showed its radio remote HMI transmitters and the related receivers. The receivers’ CAN interfaces support CiA 301. The Italian company established in 1988 offers a range of radio remote HMI (human machine interface) for construction machines. 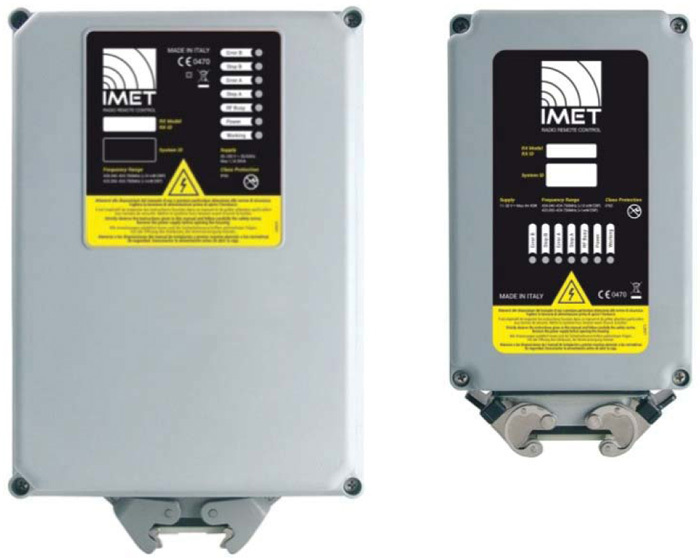 The M880 transmitters are IP65-rated, the corresponding receivers with CAN connectivity are IP66-rated. The operating temperature of the receivers is specified from -25 °C to +70 °C. All of them support CANopen. The products differ in the number of relays and analog interfaces. Common are emergency stop functions (PL-e according to ISO 13849-1). The M880 series of receivers varies from on/off functionality to more complex ones with local digital and analog I/Os and data-feedback. The CAN interface supports CANopen as specified in CiA 301. The housing is made of impact-resistant plastic. The frequency is adapted automatically to the transmitter. The encoded radio transmission is continuously. This avoids receiving commands from other transmitters, which are in the same area but not assigned to this receiver. The transmitters are available in different variants. This includes simple devices with few buttons up to complex units with integrated display and multiple joysticks. The maximum distance between transmitting and receiving devices is 100 m. The wireless communication is based on the I.S.M. band (790 MHz) or 2,4 GHz.